A delicate oil on canvas landscape capriccio of an Arcadian landscape with figures and sheep and goats in the foreground. A stormy sky and blasted tree populate the landscape and the figures are very refined and detailed. It is a delightful painting in a fine Salvatore Rosa gilded frame of the period. Painted, I would suggest, circa 1670 and attributed to a French artist painting in Italy around the time of Gaspard Dughet. A real country house painting. Stunning gilded 17th/18th century Salvatore Rosa frame. 32 inches by 26 inches. Very good condition. Relined, in very good condition. Has had profesional restoration. Gaspard Dughet (1615 - 1675) - French landscape painter, draughtsman and etcher, born of French parents and active in Rome (called also Gaspard Poussin). He is one of the most difficult seventeenth-century artists to identify and define, even though he achieved success in his lifetime and his pictures continued to be in demand for two centuries after his death. He became associated with Nicolas Poussin (whose surname he adopted) at an early age because Poussin married Gaspard's sister, Anne-Marie Dughet, in 1630. It is assumed that Gaspard was taught to paint by his illustrious brother-in-law in the early 1630s, in spite of the fact that Poussin at that time was totally preoccupied with mythological and religious subject-matter and had not turned his attention to landscapes. It is likely, therefore, as nothing but landscapes survive from Gaspard's hand, that he was the initiator of the classical landscape painting. 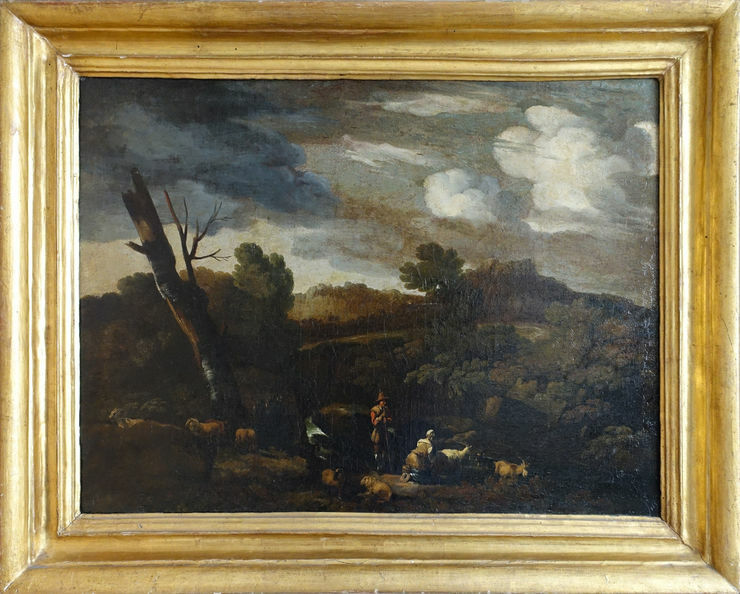 These earliest essays may well be the group of pictures formerly put together as The Silver Birch Master, although there is now a theory that these works represent Poussin's earliest landscapes. The best-documented works by Gaspard are some landscape frescos in the Roman church of S. Martino ai Monti, dating from the early 1650s. The superb series of landscapes in gouache in the Colonna Gallery in Rome show him at the height of his powers as a decorator. 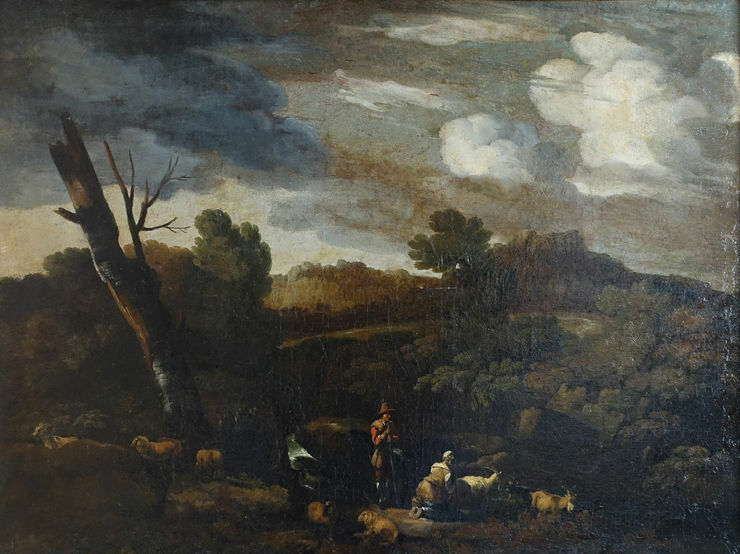 It has always been thought that Gaspard's cold, stylised pictures with intense blues and dark trees are his later works, all painted under the influence of Nicolas Poussin's classical landscapes of about 1650.